Holidays are so much more fun if you add food:). I know that when I think about holidays, there are just certain foods we associate with particular holidays. Hamburgers mean it's the Fourth of July or Labor Day; ham is an Easter food, Thanksgiving isn't complete without turkey, and Christmas is the season for all things peppermint! Food can add a fun factor to any holiday. 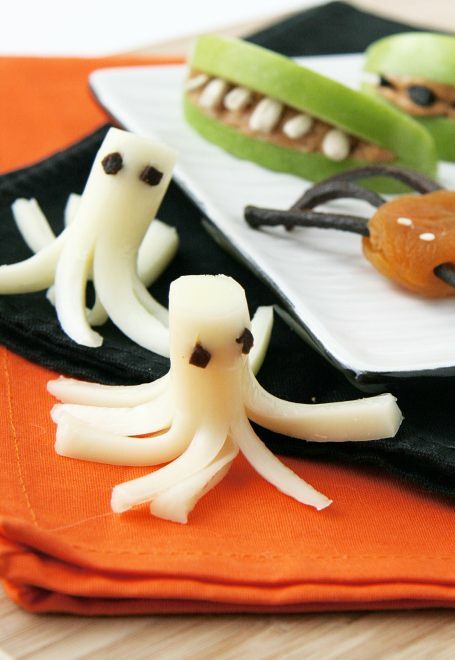 * Slice the bottom half of a cheese stick and add eyes for some cheesy little ghosts! *I featured this recipe in an April Fool's article, but it surely works for Halloween- Jello Worms. * Dip half a banana into white chocolate and add two chocolate chips for eyes- you have a tasty and sort-of healthy ghost treat! 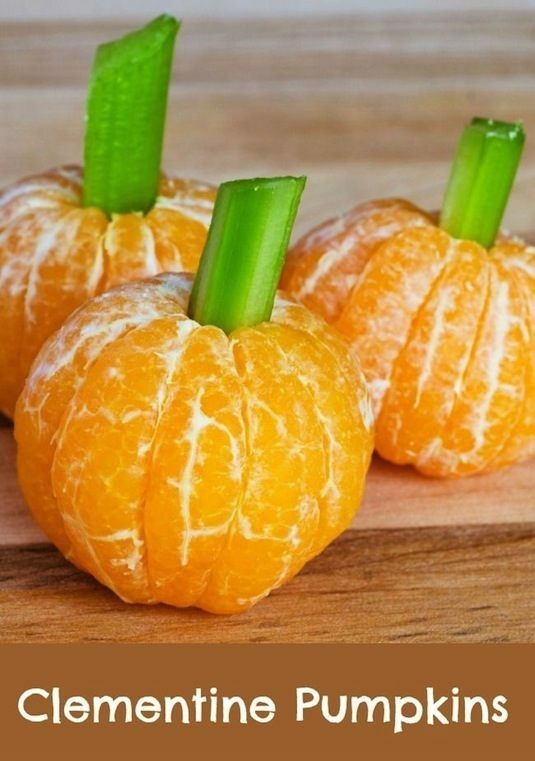 *Peel a clementine and stick a piece of celery in the center for a cute and healthy pumpkin snack. *Make jack-o-lanterns out of pretty much anything. 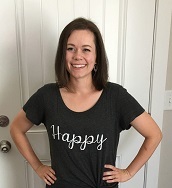 You could have quesadillas and cut out eyes, a nose and a mouth ; you could use olives for the mouth and triangular tortilla chips for the eyes and mouth on top of bean dip or any other cheese covered dish, etc. *Make mummy pizza! You could do a big one, or do a bunch of mini ones! *Stick a pretzel stick into a Reese's peanut butter cup to create witch's brooms! *Make spiders out of oreos or mini chocolate donuts; you can use licorice or pretzels for the legs and frosting or mini M&M's for the eyes. 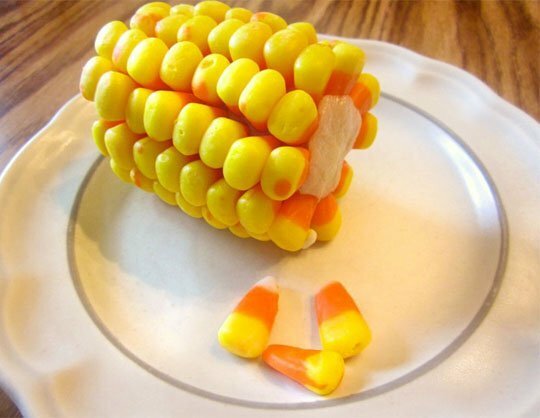 *Make corn on the cob using candy corn and eggless cookie dough! 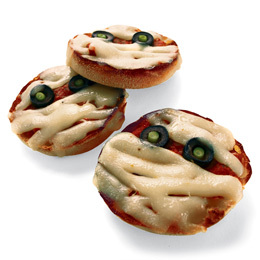 *Cut peanut butter sandwiches into the shapes of coffins or headstones; if you are really dedicated and have a small decorating tip you could write 'RIP' on each sandwich to make them extra spooky. *Top your Shepherd's Pie with some ghoulish mashed potatoes! I know there are tons more ideas out there- what ideas do you have? I'd love to add more ideas to my Halloween Cookbook;). Have you created any special holiday cookbooks in your Cook'n program? Share your thoughts and ideas in the comments below!